For other people named Randy Jackson, see Randy Jackson (disambiguation). Bassist, singer, record producer, entrepreneur, television personality. Randall Darius "Randy" Jackson (born June 23, 1956) is an American bassist, singer, record producer, entrepreneur and television personality. He is best known from his former work as a judge on American Idol and executive producer for MTV's America's Best Dance Crew. Jackson has won a Grammy Award as a producer. Jackson was born on June 23, 1956, in Baton Rouge, Louisiana, the son of Julia, a homemaker, and Herman Jackson, a plant foreman. His first marriage, to Elizabeth Jackson, was dissolved in 1990; they had one daughter named Taylor. In 1995, Jackson married Erika Riker, with whom he has two children, a 14-year-old daughter named Zoe and a 12-year-old son named Jordan. In 2003, Jackson lost 114 pounds (52 kg) following gastric bypass surgery. He stated in a February 2008 television commercial that he has type 2 diabetes. In the early 1980s he played on three albums for Jean-Luc Ponty and with the rock band Taxxi. From 1986 to 1987 he was a session musician for the rock group Journey. Jackson played on Journey's 1986 album Raised on Radio. He moved to Italy in the late 1980s and played on a record by Italian pop star Zucchero. The record, Zucchero and the Randy Jackson Band, was produced by Corrado Rustici who played guitar with Jackson on many albums in the early 1980s. He also played with Billy Cobham. In 1985, Keith Richards was asked to provide music for the Whoopi Goldberg comedy vehicle Jumpin' Jack Flash. Richards assembled an all-star band which included Aretha Franklin on piano and lead vocals and Jackson on bass guitar. This song was the fourth track on Aretha's 1986 album titled Aretha. Jackson can be seen in the song's video. In the late 1980s, Jackson was still doing sessions. He was notably on the first solo album by famed session guitarist Steve Lukather. Jackson was a featured bass guitarist on five songs on Maze's 1989 "Silky Soul" album. He also performed on several of Kenny G's albums. Jackson was the bass guitarist on the 1991 self-titled Divinyls album (which features the song "I Touch Myself") as well as featured bassist on several tracks of Tracy Chapman's 1992 release, Matters of the Heart. He performed on the singles "Bang Bang Bang", "Open Arms", and "Dreaming on a World". That same year, Jackson also played bass on Bruce Springsteen's song "Human Touch." Jackson has recorded, produced, or toured with many well-known artists and bands, ranging from Mariah Carey (he has worked with her throughout her career, been her musical director for a number of her tours; he has formed part of her band during numerous performances including Live 8 in London in 2005) to 'N Sync, Whitney Houston, (produced) Dionne Farris' (critically acclaimed debut CD, Wild-Seed Wild-Flower), Céline Dion, Fergie (dating back to her days in Wild Orchid), Stryper, and Madonna (he played some bass on her album Like a Prayer although not on the single of the same name). Jackson played numerous times in Jean-Luc Ponty's backing band. His credits as a session musician range from playing with Aldo Nova, George Benson, Blue Öyster Cult, Jon Bon Jovi, Michael Bolton, Clarence "Gatemouth" Brown, Billy Cobham, Bob Dylan, Aretha Franklin, Herbie Hancock, Ernie Isley, Billy Joel, Brent Bourgeois, Journey, Richard Marx, George Michael, Stevie Nicks, Imogen Heap, Bruce Springsteen and Roger Waters to playing at the Grand Ole Opry with The Charlie Daniels Band. His production/songwriting work in the San Francisco Bay Area with Narada Michael Walden and Walter Afanasieff led Jackson to be in demand as a producer as well. On March 11, 2008, Jackson released an album produced entirely by himself, titled Randy Jackson's Music Club, Vol. 1. The album's release was preceded by the single "Dance Like There's No Tomorrow" sung by Paula Abdul. In 2009, Randy began working with former Idol finalist Kimberley Locke, producing her 4th album. The lead single, "Strobe Light", was released March 16, 2010. In February 2010, Jackson participated in We Are the World 25 for Haiti as part of the chorus. Jackson is the manager for the Charlotte-based band Paper Tongues. With the help of Jackson, they signed with a major label, A&M/Octone Records. He has also worked as an executive, spending eight years as vice president of artists and repertoire (A&R) at Columbia Records and four years heading A&R at MCA Records. Jackson also hosts a radio top 40 countdown known as Randy Jackson's Hit List, which is syndicated by Westwood One. Every week, Jackson counts down his top 30 Urban AC and Mainstream AC hits. He also gives behind-the-scenes information on American Idol on the internet radio station Artist Underground. Starting in 2002, Jackson was one of the panel judges on the Fox Network reality television series American Idol, along with Paula Abdul (2002–2009), Simon Cowell (2002–2010), Kara DioGuardi (2009–2010), Ellen DeGeneres (2010), Jennifer Lopez (2011–2012), Steven Tyler (2011–2012), Nicki Minaj (2013), Mariah Carey (2013) and Keith Urban (2013). As a result of Cowell's departure, Jackson was left as the sole original judge on American Idol. His role was originally going to be reduced to that of a mentor, so the 2013 season would have all new judges, but it was later decided that he would remain as a judge for season 12. On May 9, 2013, Jackson announced that he would be leaving American Idol after twelve seasons due to him wanting to focus on other business ventures. On September 3, 2013, it was announced that Jackson would replace Jimmy Iovine as the in-house mentor on American Idol. He departed the series for good in November 2014. Jackson produces America's Best Dance Crew, an American group dance competition and reality television show, which premiered on February 7, 2008 on MTV and was cancelled in 2010 due to declining ratings. Each week, the teams showcase their creative talents in choreography and their dance skills, and one crew is eliminated by the judges. The competition continues until the sole winning dance crew is awarded the title of America's Best Dance Crew, and a cash prize of $100,000. Jackson has admitted to using the show as a platform for his banner-making company. ↑ "Photograph of Randy Jackson family". Black Celebrity Kids. ↑ Neal, Rome (2004-02-02). "Idol Nearly Half The Man, Randy Jackson Goes On The Lighter Side For A New Look". CBS News. Retrieved 2013-12-13. ↑ Erickson, Sturdevant (2006). Stryper: Loud n' Clear (unabridged audio ed.). Maryland: Classic CD Books. ISBN 0-9764805-4-9. ↑ Locke, Kimberley. "New Single – Strobe Light", Official Kimberley Locke Blog, February 8, 2010. ↑ "Randy Jackson's Hit List". Affiliates.westwoodone.com. Retrieved 2013-12-13. ↑ D'Addario, Daniel (2012-08-31). "Randy Jackson No Longer American Idol Judge". Observer. Retrieved 2013-12-13. ↑ Ross, Dalton (2012-09-10). "Simon Cowell tweets Randy Jackson 'back on Idol'". Entertainment Weekly. Retrieved 2013-12-13. ↑ Marechal, AJ (2012-11-11). "Music stops for 'Best Dance Crew'". Variety. Retrieved 2012-11-11. ↑ "Randy Jackson is executive producer of 'America's Best Dance Crew.'". Boston Herald. Associated Press. February 6, 2008. Retrieved February 25, 2008. 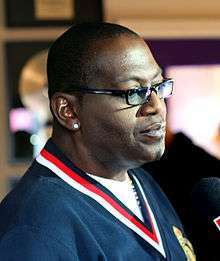 Wikimedia Commons has media related to Randy Jackson. "Siren (Never Let You Go)"